The NFL season starts tonight (not really, but let’s pretend). To get you ready for the season, we at the PFF Forecast have been previewing 2018 outlooks for each of the NFL’s divisions as a part of our weekly podcast, after spending the majority of the offseason reviewing teams’ 2017 season from the analytical perspective. The NFC West has evolved rapidly in recent seasons, from a division where the Seattle Seahawks and the Arizona Cardinals where heads and shoulders above the quarterback- and coaching-deficient Los Angeles Rams and San Francisco 49ers, to today, where the latter two teams are, in many’s eyes, the favorites to represent the division in the NFC playoffs. While we’d like people to pump the brakes on the demise of the team from the Emerald City, the fundamentals are strong for Los Angeles and San Francisco, leaving the NFC West one of the league’s most-compelling divisions in 2018. Our projections below make use of our PFFELO rating system, which is an iterative, backward-looking algorithm that leverages PFF grades to yield a schedule-adjusted power ranking that can predict roughly three-fourths of the variance in the Vegas spread on a weekly basis. Added to PFFELO are variables that take into account time zone, rest, opponent-adjusted quarterback grades, and coaching metrics, among others. Below are our full projections, as well as some other interesting discussion points for teams out west (we’re doing the AFC West next week). These projections are updated from episode 30 of the PFF Forecast. Odds are in parentheses and are sourced from BetOnline. 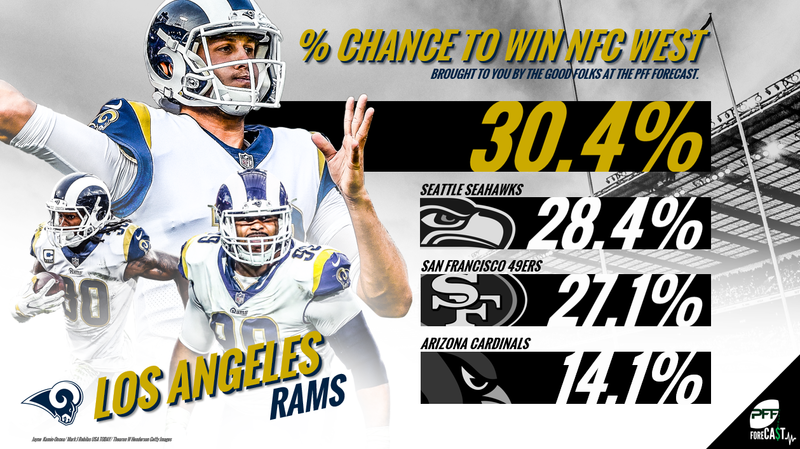 With almost a one-in-three chance, we have the Rams repeating as NFC West champions for the first time since the glory days of their first stint in Los Angeles in the late 70s. The sixth-highest-rated team going into 2018 in our PFFELO system, the Rams have added numerous pieces to the puzzle (with one major piece holding out). However, unexpected emergence is often followed by regression (and a tougher schedule – see below) hence, our projected win total for the Rams is smaller than the market. While Vegas’ win total for the Cardinals is low at 5.5, to bet the over costs -150 to win 100, meaning that their actual projection is a bit higher than that. The combination of a quarterback situation that, if the offensive line can hold up, is better than most perceive and a defense that finished the season with a top-10 rating in our PFF Massey defensive rating has us a bit higher on the Cardinals than the market, suppressing the projected win totals of the entire division as a result. For even more in-depth breakdowns on quarterback play and much, much more – grab the 2017 QB Annual before this season starts!